This week KQED, a Northern California radio station and NPR affiliate, published 25 photos from the garbage patch–some of them that I hadn’t released before. I didn’t include all of them here but I’ve posted some of the ones that didn’t appear in The New York Times slideshow. Hope you enjoy. In the middle of the Pacific Ocean, a 200lb. mass of drift net and rope has tangled together slowly over time. Though fish and crabs live successfully in and around the debris, other wildlife like turtles, sea lions and sharks get tangled in the ropes and die of starvation. 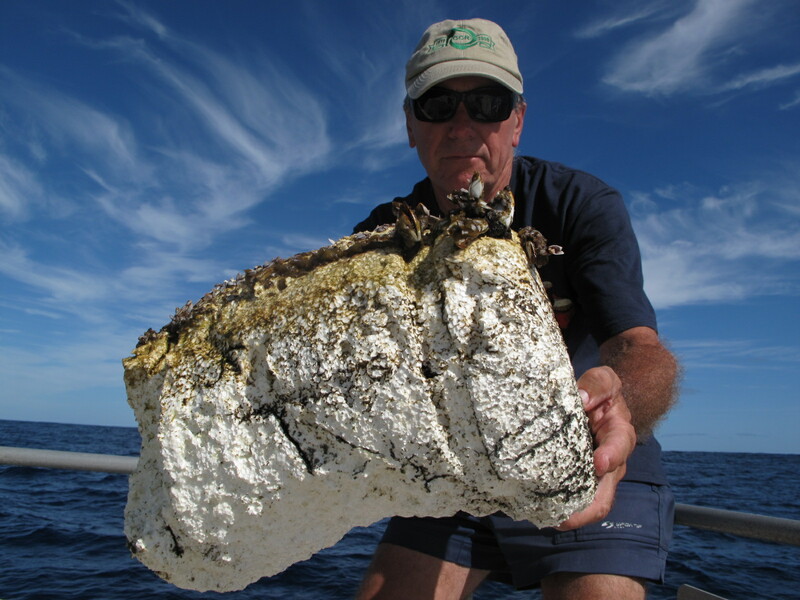 Bill Cooper, a crew member aboard the research vessel Alguita, grips a chunk of polystyrene, which never biodegrades. Polystyrene, often referred to as Styrofoam, is used to keep fishing nets afloat but contains chemicals that leech into the water and may be stored in fish tissues. 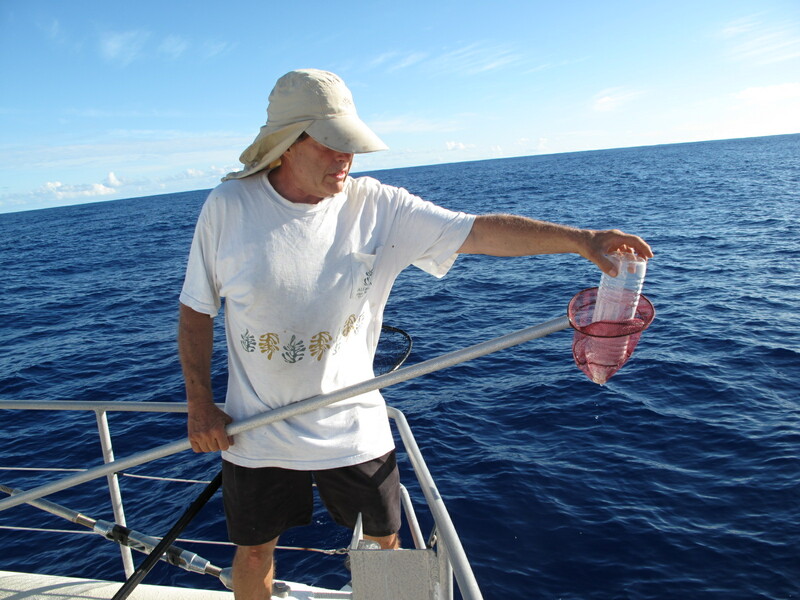 Within the Eastern Garbage Patch, Captain Charles Moore examines an empty plastic water bottle, a common sight in the middle of the Pacific Ocean. A decade after the plastic water bottle craze exploded in the late 1990s, these containers still get carried out to sea where they break into smaller and smaller pieces without ever decomposing. Five Hawaiian sergeants make their home inside a plastic yellow crate, mistaking it for a coral reef. This debris likely traveled all the way from Korea where trash is carried out to the garbage patch by the eastern flowing Kuroshio Current. A fishing net, a 55-gallon barrel and a plastic crate are among hundreds of objects that Captain Moore and his crew found floating in the Pacific Ocean in September. 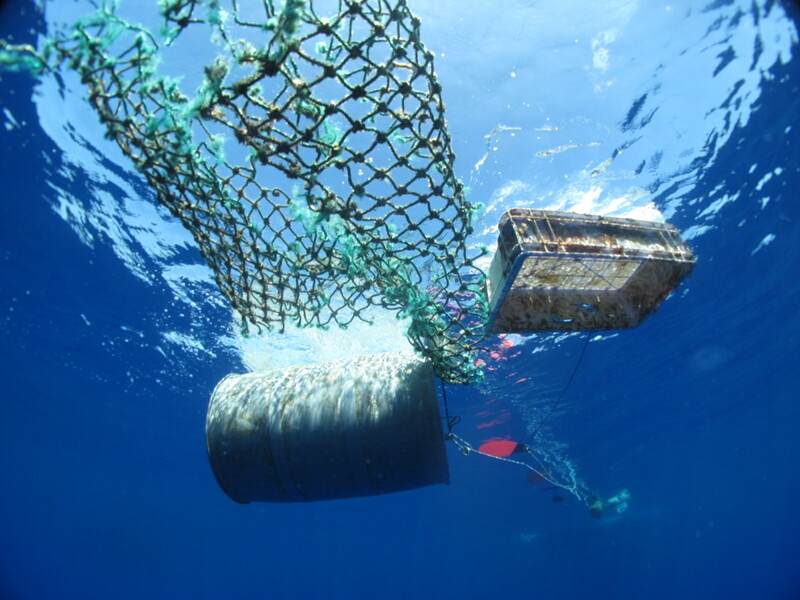 Drift nets like this one ensnare turtles, fish and sea lions that get tangled and cannot escape. The top half of a plastic bottle is still intact before it has broken down into an unidentifiable fragment. 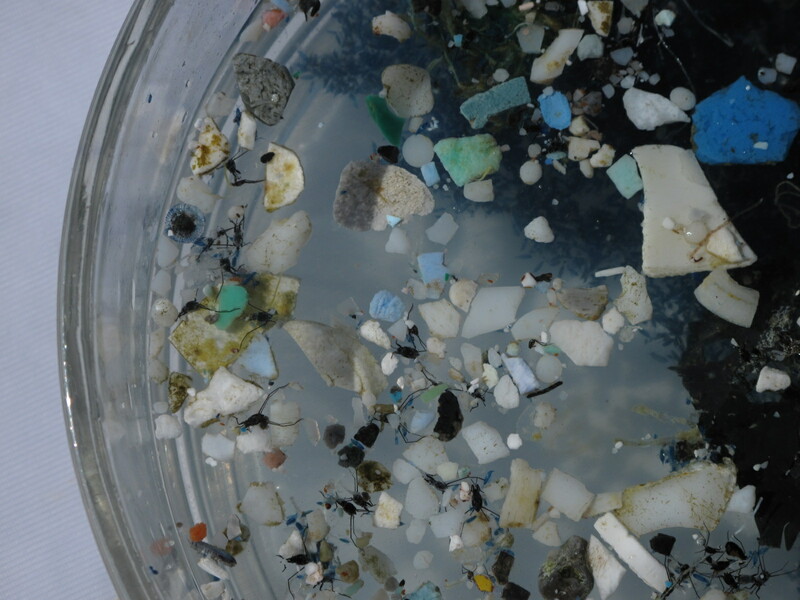 Below it a Petri dish full of plastic particles collected from the Garbage Patch suggests the amount of trash in the ocean is increasing. 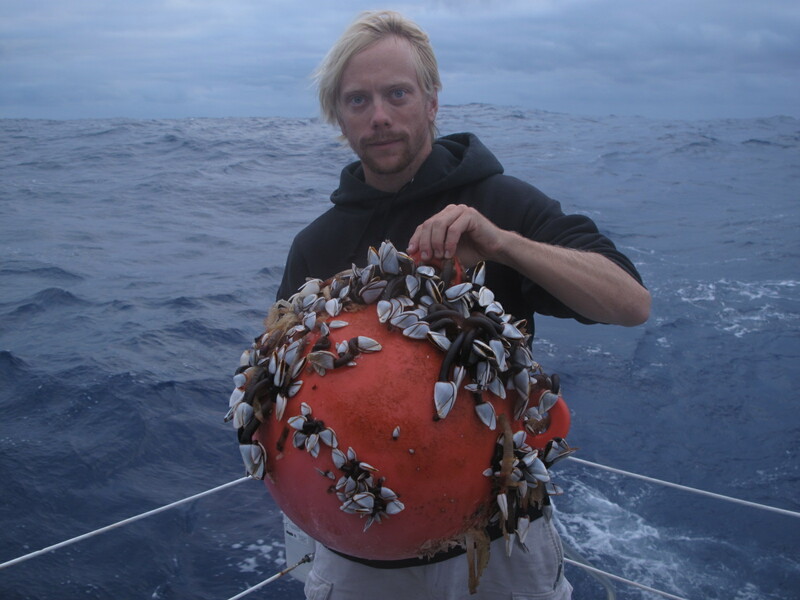 First mate Jeffery Ernst holds up a barnacle-covered buoy removed from the Eastern Garbage Patch during a research voyage in September. 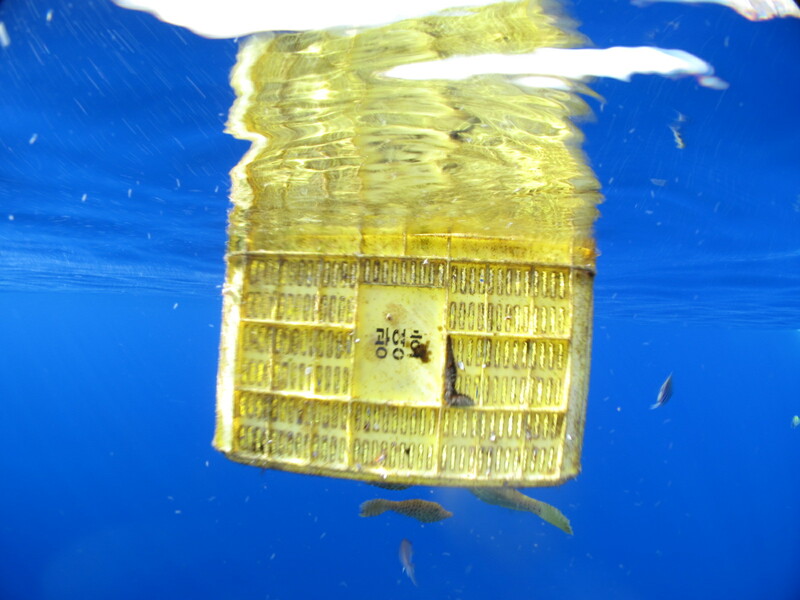 Because buoys are so lightweight, they often break free from fishing nets and end up contributing to pollution in the middle of the Pacific Ocean. 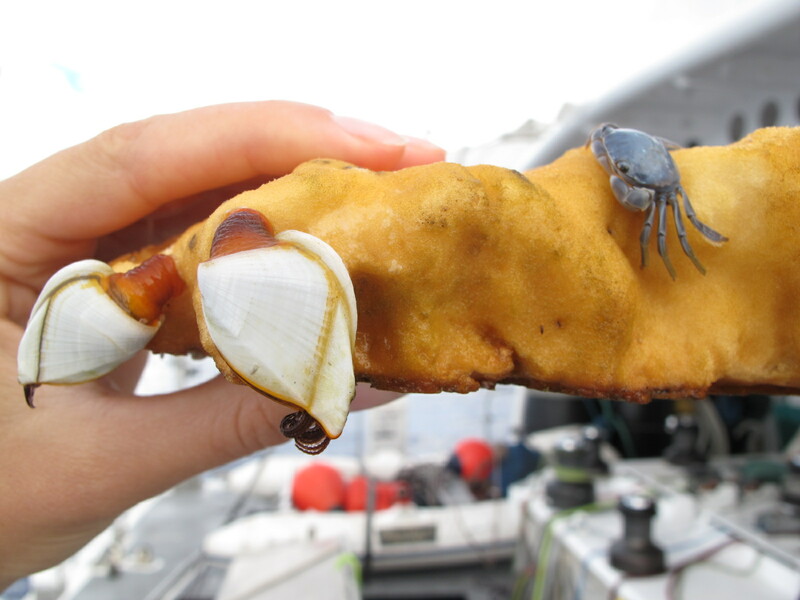 A piece of yellow styrofoam a research team found floating in the middle of the Eastern Garbage Patch is home to a blue crab and two gooseneck barnacles. 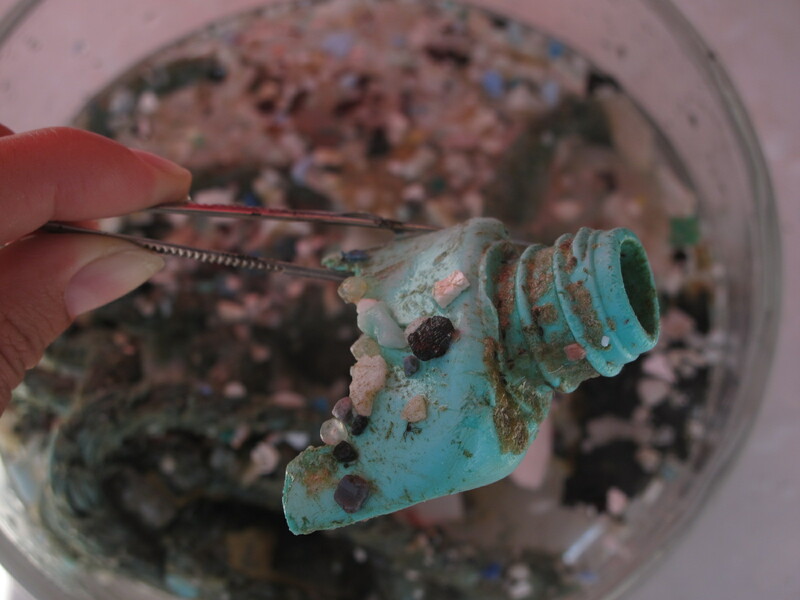 Pieces like this pervade the garbage patch where there's often more plastic than marine life. 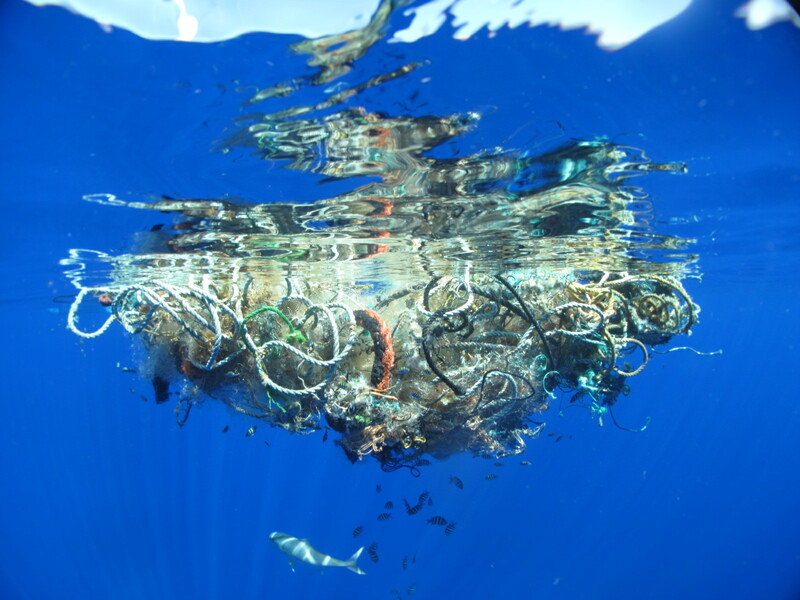 Hundreds of plastic fragments taken from the Garbage Patch fill a Petri dish that is also crammed with insect-like water striders and blue copepods. Most of the fragments are blue, green and white since the dyes in yellow and red plastic fade more quickly in the sun. These images are terrifying and haunting, and yet, at times strangely beautiful – earth abides living in the shadow of horrifying waste. Somebody should produce jigsaw puzzles from these images to raise money for awareness (from recycled material, of course). I would buy a jigsaw puzzle that would open an important dialog with my children. In a heartbeat. Glad you like the photos. I like the jigsaw puzzle idea. Robert Reed, PR Manager for Sunset Scavenger who collects SF’s waste, told me something I inherently believe–that people are twice as likely to change their behavior when they receive a message from their kids vs. from an outside source. One of my twitter-folk turned up these links to Chris Jordan’s work, creating artwork out of pet leashes to raise awareness for animal rights, and so forth. I was mesmerized by that first picture of the mass of nets and rope — however ugly these things are in action, the thing is oddly beautiful in your photo. This photo was one used for my short story, Castoff World, at the Shine Anthology weblog. Such agglomerations are called ghost nets, and they do great, heartbreaking damage. Thanks for the superb, consciousness-raising pictures!